Obstacles to the creation of a national broadcasting company have now been removed. 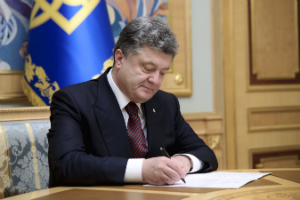 President Petro Poroshenko has signed the Law on Amendments to the Law of Ukraine on Public Television and Radio Broadcasting of Ukraine regarding the Accession Procedure of Ukrtelefilm State Enterprise. The document eliminates obstacles for the establishment of the National Public Television and Radio Broadcasting Company of Ukraine. In 2005, Ukraine committed to the Council of Europe to transform state Television and Radio Broadcasting Companies into channels of public broadcasting under the relevant European standards. The reform of state broadcasting was started in April 2014. However, there are still several organizational problems that require legislative amendments on public broadcasting.